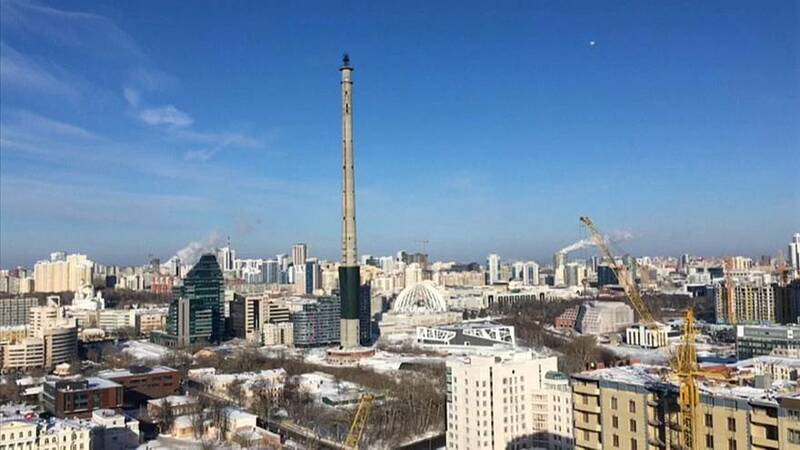 It was the world's tallest abandoned structure, and was never even finished, but now some locals in Russia's fourth-largest city, Yekaterinburg, in the Urals, are mourning the demolition of their TV tower. In their eyes it was a distinctive landmark. It was an eyesore for others, who are happy it is making way for an ice hockey stadium with seating for 15,000 fans. The demolition is part of reconstruction plans for the 2018 FIFA World Cup. Construction on the tower began in 1983 but was halted in 1991 after the collapse of the Soviet Union. It was formerly 214 metres, (700 feet), tall, with 26 floors and no lift. Yekaterinburg will host groups A, C, F and H at the international football tournament that starts on 14 June in Moscow.